So we enjoy the powerful advantage to offer you the best resources. Q5. Can you add our own logo on the products9 A : Yes. And we also give you our suffestion for your design. Knitted Baby Clothes Romper Stock Infant Black Rompers For Baby Packaging & Shipping Product name Knitted Baby Clothes Romper Stock Infant Black Rompers For Baby Brand e2woo or OEM & ODM Fabric 100%cotton Accessories silk printing Function breathable Size 70cm 80cm 90cm 100cm this size refers to correspondent kids' height measure. Or packed as customized carton for Knitted Baby Clothes Romper Stock Infant Black Rompers For Baby Baby Clothes Factory Baby Boy Chevron Romper Set Of Baby Product Wholesale 1. Are you broker or factory9 Factory, we have factory audit by Alibaba. 2. Do you have any Certificate or Test9 For entry to your country, we can do as you required test or get certificate 3. Do you have your brand9 Yes, e2woo. if you are not using us now, we invite you to give us a try, you will enjoy a great 'purchasing experience' from our deep service ! our success has been based on our understanding of the demands and nature of promotional and marketing deadlines. but we can promise that we will never overcharge you. payment term t/t, l/c, paypal, western union, money gram, escrow etc. 2.What is the total leadtime to receive 2-5 samples9 -If stocked sample, 1~2 days to arrange. 4.Are we able to change the design, color or fabric9 -Yes, we provide OEM and ODM service. 5.Can we brand the item with our logo9 -Yes, you can brand the item with your logo. we check the finish ed diaper and other items one by one, make sure the quality is good. v comfort cuffs,avoid personal friction, will not hurt baby&rsquo;s skin. v with top fashionable strip pattern makes baby looks nice, besides, strip design will not show the dirt. 7. How can I get some samples9 We are honored to offe r you samples. 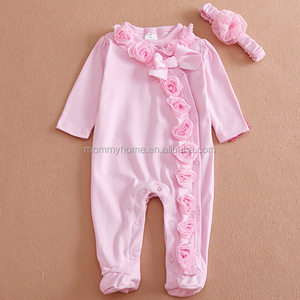 ,outfit etc or boys romper suits , they are so soft and made with the best cotton chiffon nylon silks. Our Frilly Fancy baby clothes will put a smile on her face when she wears it . cotton or as customer request 5: Color As show or as customers' request 6: Size 0-24 month/ as per request 7: OEM/ODM welcome 8: Price Terms Fob xiamen, CFR or CIF 9: Payment Terms LC at sight. 10: MOQ 1000sets, welcome trial order 11: order OEM and ODM are welcomed 12: Packaging 1). Inner Packing:A plastic bag for each piece 2). 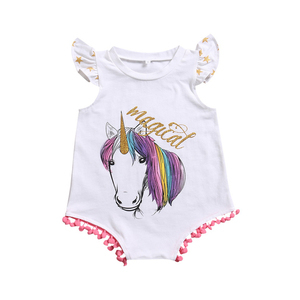 Baby Romper Set, baby clothes, baby product Description: baby romper Material 100% Cotton Detail Solid Colour/ Placement Printing Good quality with competitive price. MOQ: 1000 Piece per design within 3 colour and 5 size SIZE: According to customer's measurement Packing : header, hook, sticker, polybag, carton or according to customer's requirements Payment Terms T/T; L/C Delivery time: 45 days after counter sample approved Port of loading: Xiamen, China More information, we are here waiting for you!! 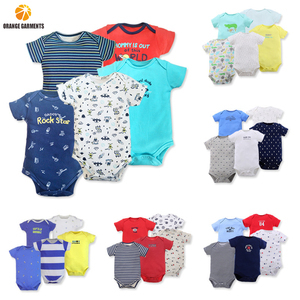 Alibaba.com offers 53,931 romper stock products. About 65% of these are baby rompers, 10% are women's trousers & pants, and 5% are baby clothing sets. 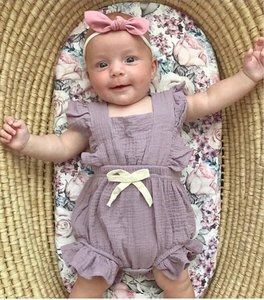 A wide variety of romper stock options are available to you, such as 100% cotton, 100% organic cotton, and spandex / cotton. You can also choose from oem service, in-stock items. As well as from adults, infants & toddlers. And whether romper stock is women, baby girls, or baby boys. 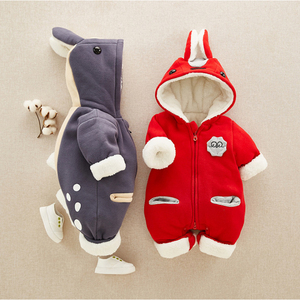 There are 53,931 romper stock suppliers, mainly located in Asia. The top supplying country is China (Mainland), which supply 100% of romper stock respectively. Romper stock products are most popular in North America, Western Europe, and Eastern Europe. You can ensure product safety by selecting from certified suppliers, including 518 with Other, 401 with BSCI, and 73 with ISO9001 certification.